When Fr Carlo Pensa, the Superior General of the order visited England in 1958 he suggested that a seminary was needed to ordain priests to carry on the work of the Sons of Divine Providence in Britain. In the small town of Upholland in Lancashire there was a large residential college: St Joseph’s which not only provided general education for boys in the junior school but also prepared older boys for the priesthood. In 1960, Fr. Bidone was informed that a small farm in Walthew Green, a village on the outskirts of Upholland, was up for sale. He travelled north immediately to view it reckoning that it would make an ideal site for a seminary since it was so near to St Joseph’s college. Although the farmhouse was very dilapidated and the land was overgrown he purchased the property and in the winter of 1960-61 Fr. Joseph Tirello, Fr Angelo Quadrini and four students moved in and struggled to make it habitable. There was no running water or proper heating and the roof leaked. Their plight was discovered by a local lady of Italian descent who mustered her friends and neighbours and came to the aid of this “so cold, so poor” band of priests and students providing them with food and clothing. The farmhouse, hastily made barely habitable, became the first novitiate house for the students studying for the priesthood at St. Joseph’s college with Fr. Joseph as their novitiate master. Having got the farmhouse habitable they turned their attention to the stable converting it into a Chapel. In the meantime the land was cleared and work was commenced on building the seminary. Archbishop, later Cardinal Heenan, laid the foundation stone in July 1961. The cost of designing and erecting the seminary was met almost entirely from money donated by generous benefactors prominent among whom, were the Colombo family from Italy. The seminary was completed in 1964 and was officially opened by the Archbishop of Liverpool on 5th September 1964. The seminary received postulants for the next ten years. In 1962, on Pentecost Sunday, Elio Frison and Bruno Parodi became the first two priests to be ordained in England. They were two of the students who had lived in the converted farmhouse and prayed in the small chapel converted from the stable while studying at St. Joseph’s college. In 1960 the Chapel at Hampton Wick was adorned with a mediaeval Gothic stone statue of Our Lady, which had been donated by an antique dealer. When Pope John XXIII was shown a photograph of the statue he signed it with the words ‘Hail, Star of the Sea, God’s own Mother blest. The chapel was extended and the extension blessed by Cardinal Heenan in 1967. Don Orione had always commended the care of people with learning disabilities to his Sons. So having established homes for the elderly Fr. Bidone next turned his attention to the people with learning disabilities. In 1961, he found and acquired a large house, which had once been a private school, in Ferry Road Teddington, not far from Westminster House. The Colombo family from Cassano d’Adda in Italy met the cost of the purchase as a gift to the Sons of Divine Providence in memory of their son Angelo who was tragically killed in an accident. The house was converted into a residential care home for up to twelve children with learning disabilities aged from five years to school leaving age. It was officially opened in 1965 and named Colombo House in memory of Angelo Colombo, closing in 2000 it was later refurbished and now provides supported housing to 6 people with learning disabilities and a small 6 bedded care home on the ground floor, named St. John’s. In 1963 No. 13 Lower Teddington Road was purchased and converted into an eight-bedded nursing home to provide in house nursing care for ill residents. It was opened in 1966, closed in the 1970’s and now houses the head office function of the congregation in England. By the late sixties the Hampton Wick complex provided a residence for elderly gentlemen in Westminster House, a nursing home in St Mary’s, a hostel on the upper floors in St Stephen’s (No. 21) and offices on the ground floor in St. Stephen’s. Today this part of the assets comprises the home for the religious community and a number of affordable housing units. See our section on future developments. In May 1967, John Perrotta and Diego Lorenzi were ordained in Liverpool Cathedral. In 1967 Malcolm Dyer from Kingston upon Thames went to Upholland as a postulant and so became the first Englishman to join the Sons of Divine Providence. He made his first profession on the 18th of February 1969. In 1968, ten acres of land were acquired in East Molesey for the purpose of building a complex to provide accommodation and employment for people with learning disabilities. This site now continues to provide that service but also has a number of supported housing units. It is intended to redevelop the whole site in the next few years. See our section on Future developments. During his visits to Argentina in 1921 and 1934 Don Orione’s attention was drawn to England and the English way of life. This was possibly because of the many links that existed between Argentina and Britain and he set out to learn as much as he could about the country. “Half the world speaks the English language,” he wrote. “I have prayed and reflected, meditated and thought and I feel it is necessary and urgent to establish The Sons of Divine Providence in England”. 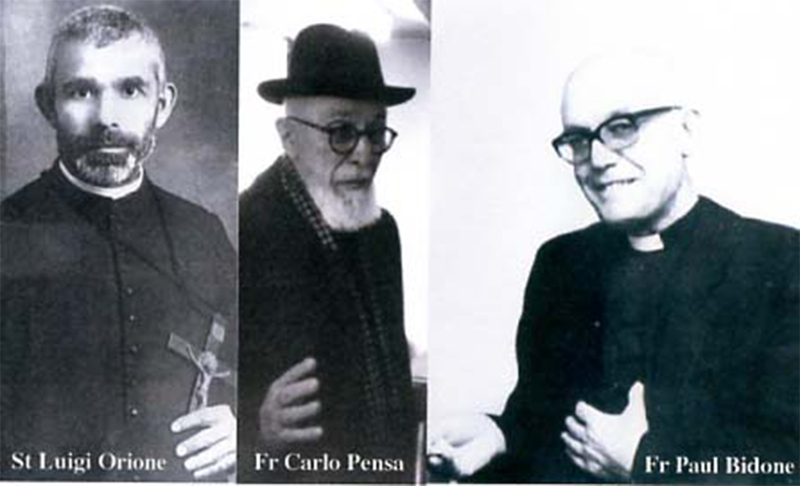 In 1936, three Italian priests of the Order: Fathers Gaetano Piccini, Luciano Mancini and Hadrian Calegari were sent to Cardiff where they opened a house catering for the needs of the Italians who worked in the Welsh coal mines. The house, however, was closed at the outbreak of World War II and the establishment of the Sons of Divine Providence in Britain was suspended. Don Orione died on 12th March 1940. So it was left to his successor as Superior General of the Order, Father Carlo Pensa to sanction the re-establishment of a presence in Britain. He chose for this purpose Father Paul Bidone an enthusiastic young priest who had joined the order following a personal encounter with Don Orione. World War II and particularly the blitz had left Britain with its cities in ruins and its population struggling to recover from the aftermath of war. The ‘welfare state’ was in its infancy with limited resources and it was struggling to cope with providing care for the many, many orphans, handicapped and aged. Father Bidone left his mother, his family, the congregation at Tortona and the warmth and colour of his native Italy and set off for England. He arrived in April 1949, to a cold and grey London with just one ten-shilling note in his pocket and speaking not a word of English. He was fortunate, however, to have some friends in London who obtained for him an attic room close to Brompton Oratory. The accommodation suited his requirements well: it enabled him to attend the early morning Mass at the Oratory before setting off to an English Language School in Oxford Street. Learning English was his first priority and he attended twenty lessons in all. The smoke-filled atmosphere of London, however, did not suit him at all and his health began to deteriorate. An Italian born parishioner of Brompton Oratory, Signorina Parodi by name, came to his aid. She was well acquainted with the Reverend Mother Superior of St. Augustine’s Priory in Haywards Heath to whom she wrote. So it was, that Fr Bidone moved to St Augustine’s Priory in June 1949. In the cleaner atmosphere of Sussex his health was soon restored and he got to like the Priory so much that he thereafter regarded it as his home. During his first year in Haywards Heath Fr. Bidone began his complete mastery of the English language. One of his tutors was the celebrated Catholic poet and historian Hilaire Belloc.